Discarding munitions in coastal waters and on the high seas characterized a swift technique for disposing of unwanted materials and challenging waste all over the world. In the years following WWII, there were almost no options to sea dumping and submerging to dispose of existing, no longer needed arsenals. But, the ocean is not an unlimited resource and it is “giving” our trash back! These munitions are washing up on beaches, getting snagged in fishing nets and leaching hazardous waste into our environment. At VRHabilis, we are proud to be an integral part to the solution, that of Underwater Unexploded Ordnance (UXO) characterization and removal. 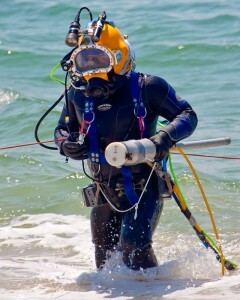 Our Diver UXO Technicians are dually certified by the U.S. Navy or equivalent, to dive SCUBA and Surface Supplied, any time of the year, in handling UXO. We are capable and own the equipment for all kinds of diving and our experience allows us to select the best of each for every job. Safety, quality, forethought, planning and attention to detail are our highest priorities. We at VRH also take great pride in our participation in training local authorities what to do once an anomaly is found and before our crew arrives. Our Technicians give presentations and provide manuals as a reminder after we have departed, of the importance in following procedures where hazardous waste is involved. VRH currently provides Emergency Response services for the New England District of the US Army Corp of Engineers, the Huntsville District of USACE, and the Massachusetts Department of Environmental Quality. Before you can collect it, you’ve got to figure out what it is! The VRH cutting edge approach to Remedial Investigation Feasibility Studies (RIFS) has lead to solutions of a decades old problem of how to handle underwater UXO. In addition, we have advanced the field with our invention of the waterproof HeckHousing for land based magnetometers. Our clients have the added benefit of being able to observe the actual day to day operations either on site or in the comfort of their own offices, due to our innovative modification of underwater communications systems. When potential UXO is found, our experts are able to see on a monitor what the diver sees and engage him in conversation to create the best and safest solution for remediation. You have an emergency involving hazardous materials? Give us a call. Just tell us what the emergency is, where it is located and when you need us and we can mobilize our Emergency Dive Team to solve your problem. Fully certified and competent in HAZWOPER regulations, UXO characterization, removal and demolition, our crew can handle any situation and arrive on the job site within 24 hours within the continental United States.